This week's launch will feature week 7 polishes from KBShimmer and Flirtin. Big Apple Of My Eye. 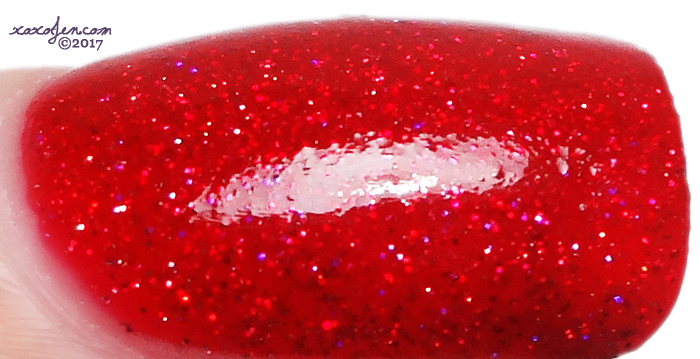 This polish is a squishy jelly red polish filled with holo and red micro metallic glitter. Formula was easy to apply and dries with a slight texture, I wore two coats with topcoat to smooth and just look at that squishiness! I failed to use a base coat with this swatch and noticed an ever so slight, almost negligable pinkness upon removal of the polish, so be sure to wear a base coat if you care about that. Pinking of You is is a soft pink with an almost opalescent type sheen to it. It contains red microglitters as well as small silver holographic glitters. This one is just in time for Valentine's Day! Formula was smooth and easy to apply, I wore two coats with topcoat. Both shades are nice and I think would be great to wear for Valentine's Day too. Love the Kbshimmer! How hard was it to remove?